West Virginia, known as The Mountain State, is a state of the United States. West Virginia broke away from Virginia during the American Civil War (1861-1865) and was admitted to the Union as a separate state on June 20, 1863. The Census Bureau considers West Virginia part of the South, because of the state being below the Mason-Dixon Line. While the USGS considers it a Mid-Atlantic state. Many in the state's Northern Panhandle, with the nothernmost point of the state about the same latitude as central New Jersey, feel a greater affinity for Pittsburgh, while those in the Eastern Panhandle feel a greater connection with the Washington, D.C. suburbs in western Maryland and Virginia. Lastly, southern West Virginia, in which many West Virginian's consider themselves southern, is less than 100 miles north of Tennessee and North Carolina. The state is noted for its coal mining heritage, and union organizing mine wars in particular. The state has a rich, stark beauty reflecting its topography. Tourist sites include the New River Gorge Bridge (where on Bridge Day the federal government, which controls the landing site, allows BASE jumping from the bridge), as well as many national and state parks. It is also home to the Green Bank Telescope at the National Radio Astronomy Observatory. The U.S. Navy has named a series of ships USS West Virginia in honor of this state. It is bordered by Pennsylvania and Maryland to the north, by Ohio to the north and west.Kentucky to the west, and by Virginia to the east and south. The Ohio River and the Potomac River form parts of the boundaries. The native vegetation for most of the state was originally mixed hardwood forest of oak, chestnut, maple, beech, and white pine, with willow along the waterways. Many of the coves are rich in biodiversity and scenic beauty, a fact that is appreciated by native West Virginians, who refer to their home as almost Heaven. The underlying rock strata are sandstones, shales, bituminous coal beds, and limestones laid down in a near shore environment from sediments derived from mountains to the east, in a shallow inland sea on the west. Some beds illustrate a coastal swamp environment, some river delta, some shallow water. 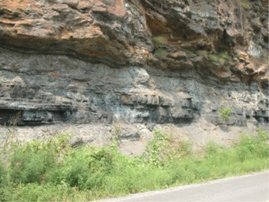 Sea level rose and fell many times during the Mississippian and Pennsylvanian eras, giving a variety of rock strata. 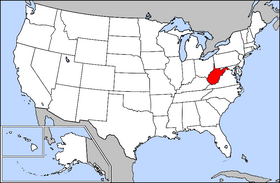 On a map West Virginia's complex shape and irregular outline make it look more like a European country in configuration than an American state. This is because the processes that created West Virginia's eastern boundaries are more like the processes that created the boundaries of European countries. In the USA most state boundaries were established close to the time of settlement and include long straight lines and simplfying features that aid in forming property subdivision for new settlers. In West Virginia the boundaries were formed after settlement for the purpose of rounding up people with a similar socio-cultural outlook (in this case pro-Union, anti-plantation, highlanders) who were already there, just as the European boundaries round up people with similar nationalities who had been there for a long time. This process of rounding up people already spread around here and there results in the typical zig-zag, curving, and extending shape of the resulting political unit. West Virginia is the only American state formed as a direct result of the American Civil War. It was originally the western part of the state of Virginia, whose population became sharply divided over the issue of secession from the Union. As Virginia grew, as a Colony and as one of the original 13 states, the portions which remained after the subdivision of the areas of the Northwest Territory which later became the states of Indiana and Illinois, and then Kentucky in 1776, became more populated. Virginia, albeit smaller, still extended from the Atlantic Ocean to the Ohio River. For the western areas, problems were the distance from the state seat of government in Richmond and the difference of common economic interests resultant from the tobacco and food crops farming, fishing, and coastal shipping to the east of the Eastern Continental Divide (waters which drain to the Atlantic Ocean) along the Allegheny Mountains, and the interests of the western portion which drained to the Ohio and Mississippi rivers and the Gulf of Mexico. The western area focused it commerce on neighbors to the west, and many citizens felt that the more populous eastern areas were too dominant in the Virginia General Assembly and insensitive to their needs. Major crisis in the Virginia state government over these differences was adverted on more than one occasion during the period before the American Civil War, but the underlying problems were fundamental and never well-resolved. In the early 1860s, as the conflicts which resulted in the American Civil War became more acute, considerable disagreements existed between those in the western part of Virginia and plantation owners in the plains and tidewater regions. Under the United States constitution, state boundaries could not be redrawn without the consent of the state in question. However, the American Civil War allowed western Virginia to form its own state. Western Virginia contained several anti-secessionist pockets, particularly around the Wheeling region, and the only three counties in Virginia to vote for Abraham Lincoln. Upon the secession of Virginia from the union on April 27, 1861, anti-secessionist legislators convened a rump legislature and formed a pro-Union reformed government based in Wheeling which claimed to represent all of Virginia. This reformed government authorized the creation of the state of Kanawha, consisting of most of the counties that now make up West Virginia. A little over one month later, Kanawha was renamed West Virginia. Though the new state's government was avowedly unionist, the counties it contained were divided in their secession votes. 18 West Virginia counties voted in favor of secession, 20 voted against secession, and one resulted in a tie. Vote records for the remaining 9 counties were lost during the war. This new state was admitted to the union on June 20, 1863, following Abraham Lincoln's signing of an act on December 31, 1862 that authorized this. It is a known fact that President Lincoln was in a close campaign when he won reelection in 1864. Thomas DiLorenzo, author of The Real Lincoln, claims that Lincoln "unconstitutionally created the state of West Virginia to shore up his electoral college vote count". Following the war, Virginia had hoped for at least partial reunification with West Virginia. However, West Virginia remained as an independent state within the Union, initially with 48 counties. In fact, two more Virginia counties elected to join West Virginia after the War, in 1866. These were Berkeley County and Jefferson County. (Five more counties were formed later, to result in the current 55). Beginning during Reconstruction, and for several decades thereafter, the two states disputed the new state's share of the pre-war Virginia government's debt, which had mostly been incurred to finance public infrastructure improvements, such as canals, roads, and railroads under the Virginia Board of Public Works, including many which were located in what became West Virginia after its formation. Virginians led by former Confederate General William Mahone formed a political coalition which was based upon this theory, the Readjuster Party. The issue was finally settled in 1915, when the United States Supreme Court ruled that West Virginia owed Virginia $12,393,929.50. The final installment of this sum was paid off in 1939. The capital is Charleston, in the southwest area of the state. The West Virginia Legislature is bicameral, consisting of the House of Delegates and the Senate. It is a citizen's legislature, meaning that legislative office is not a full-time occupation, but rather a part-time position. Consequently, the legislators often hold a full-time job in their community of residence, which stands in stark contrast to the neighboring states of Pennsylvania and Ohio. Typically, the legislature is in session for 60 days between January and early April. The final day of the regular session ends in a bewildering fury of last-minute legislation in order to meet a constitutionally imposed deadline of midnight. During the remainder of the year, legislators gather periodically for 'special' sessions whenever the governor deems one or more issues of state government in need of timely action by the legislature. The governor is elected every four years, on the same day as the president, sworn in during January. The current governor, inaugurated in 2005, is Democrat Joe Manchin. West Virginia is one of only a handful of states that does not have a death penalty for any crime. West Virginia’s highest court is the Supreme Court of Appeals and the court of last resort. The Supreme Court of Appeals of West Virginia is the busiest appellate court of its type in the United States. Only 11 states have a single appellate court, West Virginia is one of those states. The state constitution does allow for the creation of an intermediate court of appeals, but the Legislature has never acted upon this option. The Supreme Court is made up of 5 justices. Justices must have practiced law for at least 10 years. The five justices are elected in partisan elections to 12-year terms. From the 1930s through the 1990s, West Virginia's politics were largely dominated by the Democratic party, and Democrats still dominate most local and state offices. While the state continued this tradition by supporting Bill Clinton by large margins in 1992 and 1996, a majority of West Virginia voters supported George W. Bush in 2000 and 2004. Bush easily won the state's five electoral votes in 2004 by a margin of 13 percentage points with 56.1% of the vote. The most consistent support for Democrats is in the southwestern counties of the Coal Fields (especially McDowell, Mingo, Logan, and Boone Counties), while Republicans find greatest success to the east of the Allegheny Mountains, especially in the Eastern Panhandle. The population of West Virginia as of 2003 was 1,810,354. Only 1.1% of the state's residents were foreign-born, placing West Virginia last among the 50 states in that statistic. It has the lowest percentage of residents that speak a language other than English in the home (2.7%). The five largest ancestry groups in West Virginia are: American (23.2%), German (17.2%), Irish (13.5%), English (12%), Italian (4.8%). Many West Virginians identify their ancestry as "American," it is the largest reported ancestry in most counties in the state, and the state has the highest percentage of residents of "American ancestry" in the nation. Large numbers of people of German ancestry are present the northeastern counties of the state. Coal is one of the state's primary economic resources. Higher prices for fuels may soon stimulate increased mining again. The effort of unions to organize miners is a violent chapter in the state's history. In 1933 the President of the United states Franklin Roosevelt, threatened to call the National Guard in order to forcibly unionize parts of Raleigh County, West Virginia. Nevertheless, labor organizing persisted under the leadership of John L. Lewis and the United Mine Workers. The state has an extensive network of railroads, and much of the coal is transported by rail. The railways were once one of the largest customers for coal to drive the steam locomotives, but these have been replaced by diesel locomotives. Coal is rarely used now for home heating. Most coal today is used by power plants to produce electricity. West Virginia was one of the first states to engage in drilling for oil. Small to medium oil and natural gas fields still exist and are scattered mostly in the Allegheny/Cumberland Plateau in an arc throughout the western part of state. Farming is practiced throughout West Virginia, but in a form different from large extensive cash-crop agriculture elsewhere in the USA. The modal average farm size was a smallish 140 to 179 acres (567,000 to 724,000 m²), most statistics in this section are taken from the 2002 US Census of Agriculture for West Virginia, which sold less than $2,500 of crops annually. Family and single-owner operation worked 92.7% of the farms, and an astounding 96.9% were totally or partly owned by the operator. On the other hand, only 50.5% of the state's farmers considered farming to be their primary occupation, with a significant number of hours worked elsewhere each year. It should be noted that the rural poverty rate in West Virginia is 20.4% and that this figure is 5 points higher than the urban poverty rate. This description of farming portrays an independent and self-sufficient base of small land owners, but also a significant amount of rural poverty. As can be expected in a rugged terrain, raising animals was far more important than growing vegetative crops. Income from animals exceeded income from plants by about 7 to 1, with much of the non-animal income derived from sales of fodder. The chief animals raised were cattle and chickens. In the ridge and valley area along the eastern border near Virginia's Shenandoah Valley, subsidiary valleys are wide and there are some belts of rich soil which are extensively farmed. In 2002, all of the top five counties by agricultural dollar value were located near the eastern Virginia border. In traditional frontier agriculture there was much gathering of wild "greens" and other vegetation to supplement the diet. One area where this practice is still significant is the gathering of wild North American ginseng, often for the Asian market. Wild gathered ginseng contributed about $ 2 million in 2000 to the West Virginia economy, a figure larger than many conventional cultivated vegetable and fruit crops. Other wild greens, such as sour dock, lambs quarters, and wild leek (or "ramps") are also still gathered by many for table use, although today more on the basis of avocation or keeping up traditions than out of necessity. Along the western edges of the state the large rivers of the mid-continent erode a distance into the hills and it is here, in the west, that some dense pockets of heavy industry appear. In the Kanawha River Valley near Charleston and along the southern Ohio River Valley near Huntington chemicals predominate, attracted by a readily available labor force and access by barge carriers. Metallurgy, especially steel, has been predominant in the Northern Panhandle due to a spill-over effect from the traditional center of the US steel industry in Pittsburgh. . Given the unsettled present condition of the U.S. steel industry, continuation of metal-working industries in the Northern Panhandle cannot be assured. State songs: "West Virginia, My Home Sweet Home," "The West Virginia Hills," and "This Is My West Virginia"
A number of famous people were born in or lived in West Virginia.